UON Global is located at Callaghan Campus, Newcastle (at the end of the Hunter Building, opposite Bar On The Hill), with team members also available at our new Sydney campus and our Central Coast Campus, Ourimbah. It's our dedicated international student team, always available to help your needs, no matter where you are in your journey with the University of Newcastle. The office is open 9am to 5pm, Monday to Friday. Our friendly team can help you with a range of matters, or put you in touch with the right people. They can assist with a diverse range of areas. Please see UON Global Reception upon arrival. 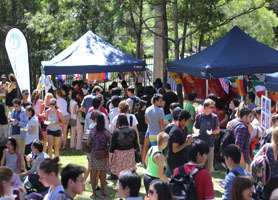 While at the University of Newcastle you can participate in a range of fun, interactive programs.